Patty Boerger, 2013 President of the Heritage Chapter set the tone for the new year with a message that “we need to be full of K.R.A.P.”. That sounds bad doesn’t it, but didn’t it get your attention. K.R.A.P. is an acronym and is explained below. ‘P’ stands for ‘Participation’. Don’t expect others to be enthusiastic about doing business with you IF you are not at the meetings. If you don’t give referrals… or if they don’t know enough about you. Be there each week and live up to your responsibility to give at least 2 referrals each month… and participate in the lunch buddies, and go to a MORE meeting at least once during the year. If you are like many sales veterans, you don’t really enjoy the telephone prospecting. It can be a grind under most any circumstances. On the Sales Prospecting Perspectives, Maegan Kopka, a 15-year sales veteran, shares her thoughts on utilizing networking to minimize the dreaded prospecting. Read On! There is a reason God gave you two ears and one mouth. This is so that you can listen to your network twice as much as you talk to it. Your networking may not be as effective as you’d like, if you are not using the right formula. If you struggle with this, Mitchell Wright shares a great four-step process in the Lean Marketing blog. Read On! Often people’s aversion to attending networking functions is that they simply do not like the feel of what they believe networking is. Whether you admit to it or not, I am sure that most people have had this feeling. In this article from TechRepublic.com, Toni Bowers asserts that the best way to network is to not think of it as networking. Read On. Imagine if you will, you realize that you have a few L-B’s (aka pounds) to lose and you are now finally committed to making it happen. Through your networking, a contact refers you to a fitness trainer who happens to be reasonably close and reasonably priced. Highly motivated, you schedule your first session and eagerly await this appointment. When the day finally comes and you arrive for your appointment, you are stunned to meet the fitness trainer. Putting it politely, he is obese – a complete contradiction to what you envisioned. Worse, in one hand, he holds a cigarette and in the other a two-liter bottle of a sugary soft drink. Nevertheless, you politely go through your first session. Although the trainer seems incredibly knowledgeable and barks you through an incredible workout, you are understandably uncomfortable continuing the professional relationship. This man is simply a poor example of the service and industry he represents. Certainly, this is an extreme example. The point to it, however, is that you need to make a close examination of your professional self and assess as how you could be a better representative of what you do. From time to time, people will refer to the shoeless cobbler’s son, and the imagery of that likely makes you chuckle. The CPA who has not filed a tax return in years. Is it not possible that, in some small way you are the 400-pound fitness trainer? It is worth consideration. It certainly cannot hurt. The difference between a meager existence and wild success at anything is usually nothing more than a slight edge. More often than not, that slight edge is achieved through a contact that might simply be an arm’s length away. And, there is no doubt that, connecting with that person involves networking. While I have not necessarily corned the market on networking expertise, it is something at which I have become quite adept (being an author, speaker and consultant on the subject of business networking). If you think that I might be able to help you capture a slight edge through some networking insight, please drop me a note (frankagin@amspirit.com) and let’s set a time to spend 30 minutes on the telephone. There is no cost to this offer. There are no catches. There is no gimmick. This is just a sincere offer of assistance. Zig Ziglar says, “You can anything you want in the world, just as long as you are willing to help enough other people get what they want.” Consider my offer as a down payment on Zig indication of good karma. Todd Tamburino, CEO of Capital City Daylighting Inc. and member of the City Center Chapter of AmSpirit Business Connections was featured in the November 9, 2012 edition of Columbus Business First’s Entreprenuer section. Tamburino talks about the strengths and weakness of being an up-and-coming business, goals, achievements, and much more! Read this article. Can I Get You A Tie? The savvy tailor does not shy away from selling ties. Certainly, the big money is in selling that custom-made suit. Whether or not the patron purchases a suit, however, the savvy tailor will sell them a tie – earning a tidy little profit on a simple, but colorful, piece of silk. Figuratively speaking, you are a tailor and all the franchise opportunities you have are like suits, almost custom fitted to each individual client. While the price of these suits range, they are the source of your big money. Following this metaphor, the AmSpirit Business Connections franchise opportunity is like the tie. It may not represent big money to you, but it can be a tidy little profit, if you let it. When you stumble across the person who could not possibly afford a suit, consider AmSpirit Business Connections. This opportunity has a low initial required investment – a little more than $10,000. When you happen upon the person who does not have the time to commit to the care of a custom-made suit, consider AmSpirit Business Connections. This opportunity is designed to be operated part-time. The AmSpirit Business Connections franchise opportunity may not be big money, but it does represent a tidy little profit. So, be like the savvy tailor and don’t shy away from selling a tie or two. 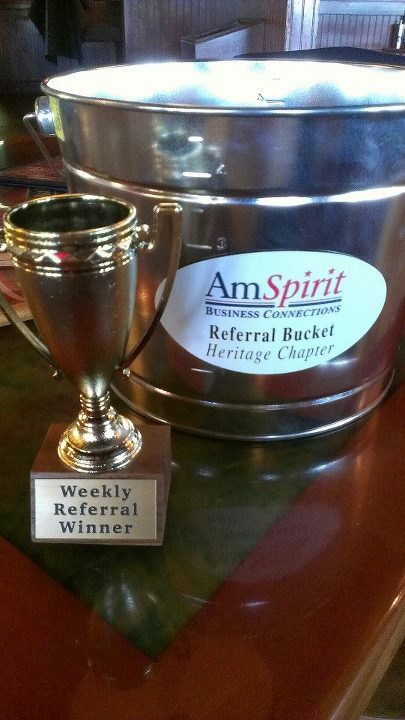 For more information on the AmSpirit Business Connections, go to http://www.amspirit.com/franchise.php of contact Frank Agin at frankagin@amspirit.com.